Government Adda 247 CPCL Engineer Jobs Government jobs CPCL Recruitment for 42 posts. 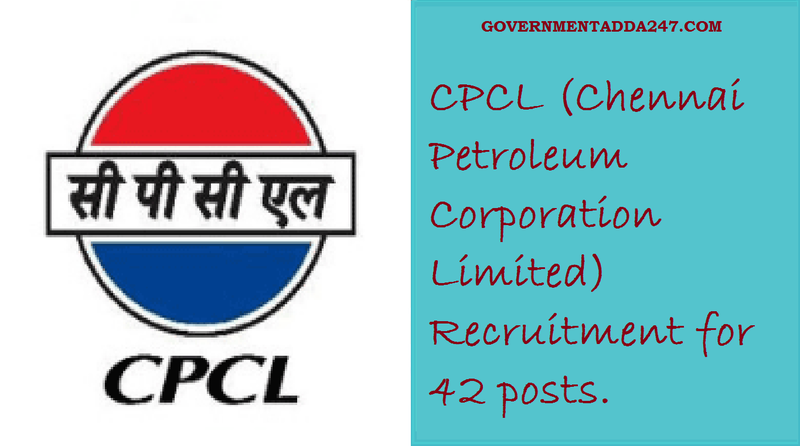 CPCL Recruitment for 42 posts. CPCL (Chennai Petroleum Corporation Limited) Recruitment for 42 posts. Chennai Petroleum Corporation Limited released the notification for the cpcl recruitment of various posts in the cpcl department. The total number of vacancies for cpcl recruitment is 42 and the posts for which recruitment is conducting are Engineer(Chemical), Engineer(Mechanical), Engineer(Electrical), Engineer(Metallurgy), IT & Officer, Human Resources Officer, Safety Officer. Interested and eligible candidates are invited to apply for the posts. The application will start with the effect from 24 September 2018 and the last date to submit the online application is 08 October 2018. To know detailed information on cpcl recruitment checks the information which is provided below.